You may have ticked sightings of Africa’s famous Big Five off your must-see list, but did you know South Africa gives you an excellent chance of getting up close and personal with the Marine Big Five? The oceans surrounding the southern tip of Africa are rich with southern right whales, great white sharks, penguins, dolphins and seals, making this the perfect launching point to see these remarkable creatures in their own habitats. We reckon that watching whales in their natural habitat mere metres from your lens is one of the most magical wildlife encounters you could ever have. Hermanus, just outside Cape Town in the Western Cape, is recognised by the WWF (Worldwide Fund for Nature) as one of the world’s very best whale watching destinations. Each year, between June and November, southern right whales migrate from the Antarctic to calve and mate in Walker Bay. From the low cliffs that line the bay you can get so close to these magnificent creatures that you could almost touch them, lending truth to the claim that this is the best land-based spot in the world for whale watching. While in Hermanus, head out on a whale watching boat trip; a guided sea-kayaking encounter; or treat yourself to an aerial whale-viewing flight for an unforgettable bird’s-eye view of these mammoths of the sea. 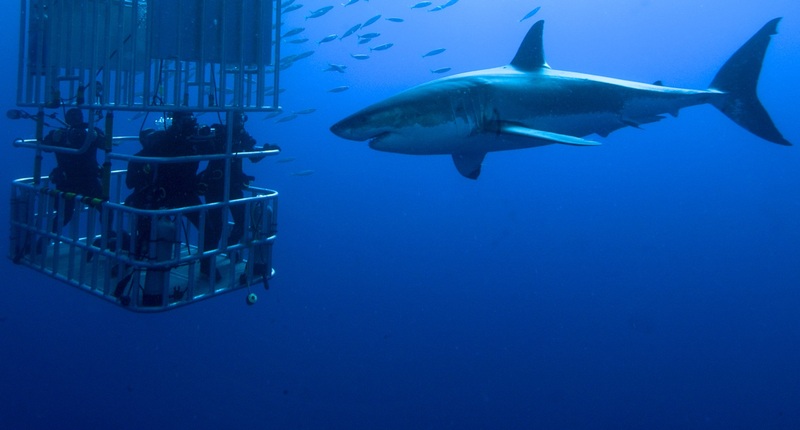 If you need a hit of sheer adrenaline, then shark-cage diving should be the next thing on your itinerary. Gansbaai, just 25km from Hermanus, is the centre of South Africa’s shark-cage diving industry. Boat trips head out to Shark Alley, where great white sharks congregate in numbers to feed off the Cape fur seal colonies and penguins that populate Dyer Island. A marine biologist will share in-depth knowledge about these extraordinary marine predators, as well as the plentiful seals and penguins. And look out for the three species of dolphins often spotted in huge pods in the waters off the Western Cape. Enchanting pods of common, bottlenose or humpback dolphin playing, feeding and surfing in these beautiful waters are a captivating sight. The southern hemisphere’s winter and spring months are considered ‘whale season’. You are almost guaranteed great whale sightings in September, October and November, although southern right whales start to appear in the bay from June onwards. Base yourself at one of our favourite properties, Birkenhead House in Hermanus. This five-star boutique hotel is the ultimate beach house, dramatically perched on a cliff-top overlooking Walker Bay and flanked on either side by a sandy cove. There is simply no need to ever leave this opulent, all-inclusive boutique hotel, with its outstanding sea views, delicious meals and welcoming, easy-going atmosphere. In whale season you can even watch southern right and humpback whales breaching from your lounger beside the one of the two swimming pools. To find out more, click here.